This story comes to us tonight out of Russia. The Russian authorities are currently investigating a strange death occurrence where a woman was killed by a homemade missile that was launched by her husband. According to news that has been released so far out of Russia, the wife was standing on the edge of a field watching her geek husband experiment with a homemade rocket. When the rocket launched, something went terribly wrong and the rocket blasted across the field and hit the wife directly in the head. The wife was rushed to the nearest hospital but died shortly thereafter. 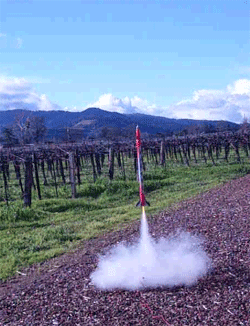 “During the launch, the model rocket veered off course and hit his wife in the head. The woman died in the hospital,” investigators said Friday. The 42-year-old husband, who works for an aviation company, could face up to two years in prison for manslaughter, the state-owned Russian news agency said.